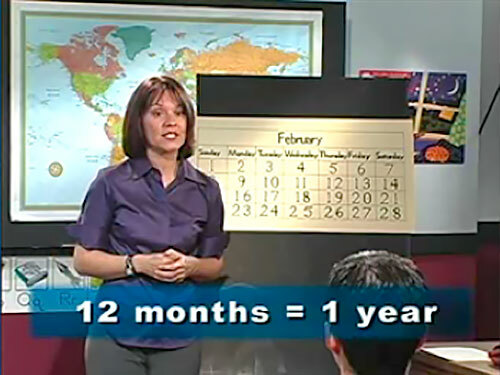 The 1st English Course is a free video-based online English course for beginner students. You will join the students in the English class video to learn basic English skills at the adult school with Ms. Marquez, the teacher. You will also complete many different online activities for English practice in listening, reading, writing, speaking, vocabulary, grammar, and life skills. There are 20 units in the 1st English Course. Each unit is based on an important topic for communicating in English. Topics include School, Time, Places in the Neighborhood, Money and Shopping, Clothes, Housing, Transportation, Seasons and Weather and more! Learning English within a topic helps you remember words and sentences you need to understand and talk about the topic. The units are divided into Vocabulary and Language Practice lessons. The vocabulary lessons and activities help you learn new words. Language Practice activities use the new vocabulary words and then teach you grammar and more English language skills. You will be practicing the new words and grammar by listening, reading, writing and speaking. After you have completed all the activities in a unit, you can take a test to check your knowledge. Then you will know if you need more review and English practice, or if you’re ready to move on to the next unit. The activities in the 1st English Course go from the easiest to the most difficult, so you should start at the beginning of the English course. We suggest that you start with Unit 1 and complete the units in order. 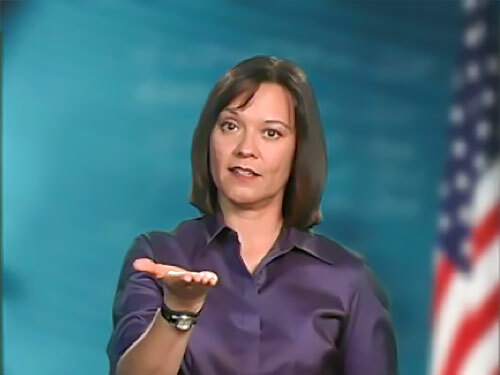 What will you learn with Ms. Marquez in the 1st English Course? You have a front-row seat in the 1st English Course classroom. Ms. Marquez presents vocabulary and basic grammar in a manner that is easy for everyone in the class (including you) to understand. In the classroom video at the beginning of each unit Ms. Marquez teaches the meaning and pronunciation of the new vocabulary words for the topic. The class is very interactive. Students in the video class answer the teacher’s questions, repeat vocabulary words to practice their pronunciation and go to the front of the class when Ms. Marquez asks them. 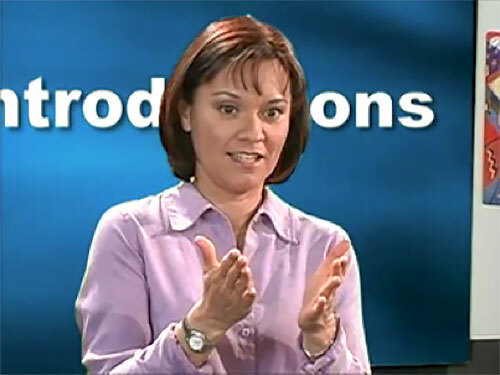 What will you learn about English outside of the classroom in the 1st English Course videos? Learning English becomes even more fun and exciting when you learn about the private lives of the students in the videos. You’ll learn conversational English watching the students use their English outside of the classroom. The friends in the class come together to study, to have fun, and to learn about living in the U.S. Watch and listen as the students practice English at work, at parties, at the store and at their homes. There is also a little romance. Which girl in class does Miguel like? Will Samantha give Ryan her phone number? When you finish the unit and go on to the next, you will find out! Living in the U.S. means everyone needs to use English for things like learning job skills, asking directions, or finding a place to live. How will you practice English in the 1st English Course? Learning to speak English is very difficult for most people. 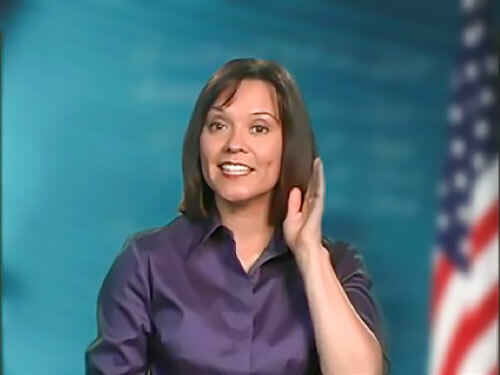 In the 1st English Course, Ms. Marquez invites you to take your turn to practice speaking with her. 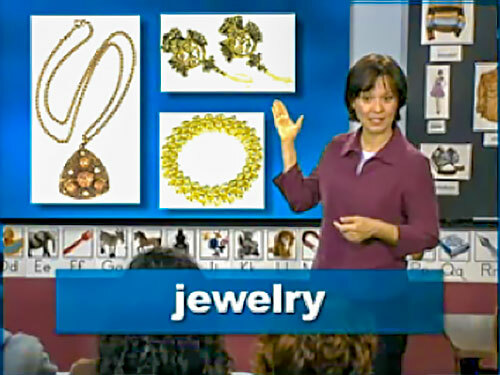 Ms. Marquez speaks directly to you in these video activities. She makes you feel comfortable so you can speak English to her with confidence. You’ll practice speaking in situations that you need in everyday life. 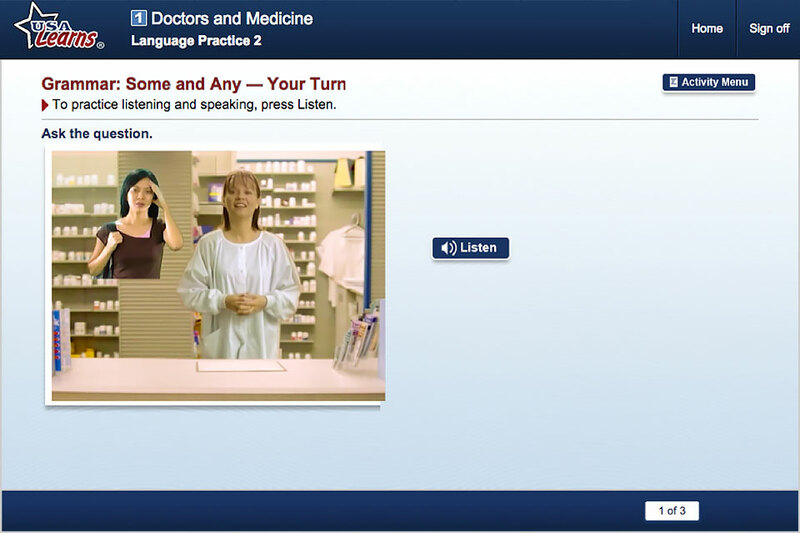 In the examples below, Ms. Marquez plays a pharmacist and a waitress. You must tell her what you want. The words are on the screen to help you so you don’t need to get nervous. You record your response and then listen to it. If you decide you don’t like it, you can keep trying until you are happy with it. This is YOUR turn to practice speaking with no fear of making mistakes. After watching the classroom video segments in the 1st English Course, you will do online activities to practice and remember the English words and sentences you have learned. These activities will help you improve your English vocabulary, listening, spelling, writing, grammar, reading, speaking, and life skills. USA Learns offers three English courses, which teach beginning and intermediate English as a second language. We invite you to learn more about all three English courses! REGISTER NOW to start your free English course with USA Learns!